A new special blend of moisture wicking fabrics and woven structure make this the best Adi-Champ uniform. 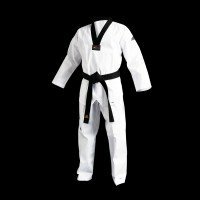 One of the most popular martial arts uniforms in the world. Made of ClimaCool material to keep you dry and comfortable with mesh inserts providing proper ventilation.